Augustans have been involved in preserving parts of their historic city for over a century, and visitors today have the opportunity to see the tangible results of those efforts in many different ways. Reverence for the past is important in Augusta, and citizens' appreciation of what is worthy of preservation has evolved over time with national trends. 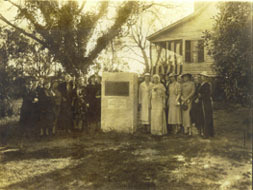 In 1900 shortly after its establishment in Georgia, the Daughters of the American Revolution (DAR) made an effort to acquire Meadow Garden, the post-Revolutionary War home of George Walton, one of three Signers of the Declaration of Independence from the state. In 1901, the DAR succeeded in getting the house, which is located beside the Augusta Canal, making it into a museum that continues in operation today. With the Walton House, the DAR became the first organization in Georgia to acquire and preserve the home of a notable historically significant person for preservation as a house museum. By the 1920's, the former Academy of Richmond County building became the new home of the Young Men’s Library Association--an early adaptive use in Augusta. Later the Augusta Museum occupied the second floor and eventually the entire academy building after the library association moved to Greene Street in 1960. Since the museum relocated to new quarters in 1994 the building has been vacant awaiting a new educational use, as stipulated by its owners, the Trustees of the Academy of Richmond County. Next door to the academy, the Old Medical College Building also became vacant, when Richmond Academy moved to new quarters. The Sand Hills Garden Club converted the 1835 Greek Revival building into a garden center to be used by community organizations for parties, social events, and meetings. Other organizations had offices there, including the Augusta Genealogical Society. In 1989, the Medical College Foundation leased the building from the owners, the Trustees of the Academy of Richmond County, and completed a thorough rehabilitation. During the project, bones found buried in the basement provided proof that antebellum medical students learned medical procedures on stolen cadavers, when it was illegal for them to do so. The building is still an events center. In 1937 Olivia Herbert, a winter resident, purchased and restored Ware’s Folly, an 1818 Federal style house. She gave it to the Augusta Art Association. Since that time, the Gertrude Herbert Institute of Art occupies the house, using the building for classes and a gallery space featuring local and regional artistic talent. Two private historic preservation efforts are notable in this period. In 1929, Dr. and Mrs. A. J. Kilpatrick carefully disassembled the 18th century Mansion House on Greene Street, numbered its pieces, and reassembled it on Comfort Road in the new Forest Hills development. In the early 1930s, Bobby Jones and Clifford Roberts founded the Augusta National Golf Club on the Fruitland Nursery property, using the plantation home as the clubhouse. The building still stands. Today it is a familiar symbol of the internationally known Masters Golf Tournament. After World War II, interest in preserving more of the area’s history led to the establishment of the Richmond County Historical Society in 1946. Two years later the fledging group bought “The White House” on Broad Street in Harrisburg, believing it to be the site of the First Siege of Augusta during the Revolutionary War. In 1964, the Georgia Historical Commission acquired and ultimately completely restored the building, operating it as a house museum. During restoration, someone discovered that the alleged “White House” was originally blue, so the Commission changed the name to the Mackey House, reflecting the owner during the Revolution. In 1975, Martha Norwood completed a definitive study, proving that the real “White House,” a.k.a. the Mackey House, was closer to the river, and that the house being interpreted as the Mackey House was actually built in 1797 by Ezekiel Harris, a tobacco merchant. Declaring it a fraud, the state quickly closed the house for tours. Later the building served as the Bicentennial headquarters. In 1982, the city took ownership and turned it over to Historic Augusta, Inc., a preservation organization. Historic Augusta reinterpreted the house to tell its true story. 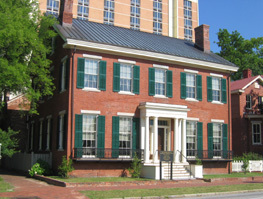 In 2004, the Augusta Museum of History assumed responsibility for the daily operation of the renamed Ezekiel Harris House. In 1965, alarmed over the casual destruction of many historic properties in the downtown and following the example of the Historic Savannah Foundation, a group of Augustans founded Historic Augusta, Inc. The new organization’s members were concerned about construction of the elevated Gordon Highway in the 1950s through downtown, demolition of the 1820 Richmond County Courthouse and the 1890 Augusta City Hall, and a threat to the 1902 Beaux Arts Union Station. Two important initiatives included conducting a survey of historic properties and conceiving a plan to create a pilot project to demonstrate the value of historic preservation. The project centered on the Old Government House (1801) on Telfair Street, headquarters of the Junior League of Augusta beginning in 1952. After creation of the National Register of Historic Places as we know it today in 1966, Historic Augusta began actively initiating nominations to the National Register, first of local landmark buildings and later of historic districts. The city adopted a historic zoning ordinance in 1970, superseded in 1992 by the present Historic Preservation Ordinance. As of May 2007, Richmond County had 44 listings in the National Register, 9 of them historic districts. The City has designated three local historic districts to protect them under the Preservation Ordinance, including Summerville, Downtown, and Pinched Gut (also known as Olde Town). Summerville and Pinched Gut (Olde Town) enjoy active and influential neighborhood associations that advocate preservation in these mostly residential districts. Individuals, nonprofits, and corporations played significant roles in preserving historic buildings as well, especially after federal preservation tax incentives became available beginning in 1976. One of the earliest projects, known as LaFayette Center, focused on the former YMCA building on Broad Street and the adjacent row of 19th century townhouses. In the mid-1980s after sitting vacant for a decade, Sacred Heart Catholic Church underwent a thorough restoration becoming a cultural center. Historic Augusta acquired the Woodrow Wilson Boyhood Home in 1991 and opened it as a house museum in 2001. The rehabilitation and conversion of Enterprise Mill to offices and apartments in the 1990’s was another successful project using the federal tax credits. The mill also houses the Augusta Canal Interpretive Center. More than 150 apartments have been developed above downtown commercial buildings in the Augusta Downtown Historic District since the late 1980s. The Lucy Craft Laney Museum of Black History and Conference Center opened in the early 1990s, preserving a historic building and informing the public about the legacy of one of Augusta’s important black educators. The City of Augusta supports preservation efforts in a number of ways including its renovation of the Old Government House in 1988 and rehabilitation of the William B. Bell Auditorium in 1989. The city established Main Street Augusta from 1991 until 2006 to help revitalize its downtown, and the Augusta Canal Authority in 1989 to preserve the Historic Augusta Canal and Industrial District and develop the Augusta Canal National Heritage Area. Augusta is a Certified Local Government and a Preserve America Community, both federal designations that demonstrate the city’s commitment to preserving its heritage for people today and future generations.